Brie, how I love thee. I went to a Thanksgiving potluck recently, and wanted to make something with cranberry sauce. I found this recipe in one of my favorite cookbooks (Cupcakes, Cookies, and Other Tempting Treats). There was no way I could pass up trying it! Preheat the oven to 400°F. Grease a 12-hole pan (or a 24-hole mini muffin pan). Sift together the flour, baking powder, baking soda, salt, and pepper to taste into a large bowl. Stir in the Brie. Place the eggs in a large bowl and beat lightly, then beat in the yogurt and butter. Make a well in the center of the dry ingredients and pour in the liquid ingredients. Stir until combined; do not over mix. Spoon half of the batter into the muffin pan. Add a teaspoon of cranberry sauce to the center of each, then spoon in remaining batter. Bake in the preheated oven for twenty minutes, or until well risen, golden brown, and firm to the touch. Let cool in the pan for five minutes, then serve warm. Notes: I used kefir, and it came out great! Don't get impulsive and add a pinch of allspice like I did. It would have been better without it. I put a little more cranberry sauce in each muffin than it called for, and I'm glad I did. It made them more moist. This says Thanksgiving to me. Do you have a favorite recipe using Brie? Newest follower via GFC from the Moms Mingle!! Come by and follow along at www.pricklybanana.com!! I love the name of your blog. Cute stuff on there, too. Following back! Newest Follower from the Mom's Mingle. These muffins look and sound yummy! Thanks Melissa. :) Following you back! New follower and looking forward to reading more! Those looks amazing! New follower from Monday Moms Mingle! Mmm, I will have to try these!! I'm following you from Mom's Mingle, thanks for co-hosting! Hope you have a lovely Thanksgiving this week! Thanks so much! Happy Thanksgiving to you, too! I'm drooling over these! I would have never thought to use Brie. Thanks for sharing and hosting the hop. I'm your newest follower and would love for you to stop by. Thank you and thanks for the link to the hop! I'm following you, too. I heart you and your site! It is one of the most adorable blogs I have come across in a long while. I also see you have an Etsy shop? I do reviews and giveaways on my blog Spunky Real Deals. I would love to help you out with some promotion! 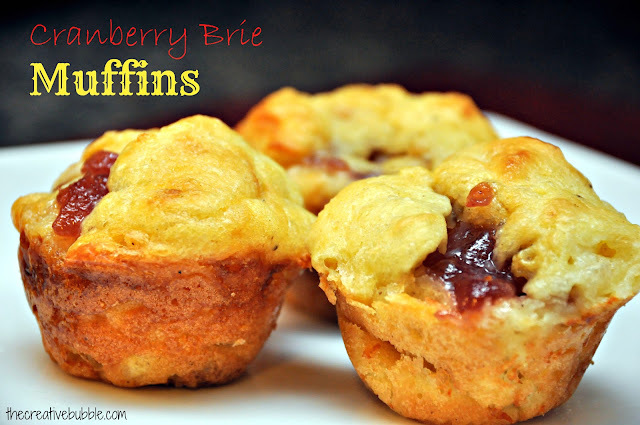 stopping by from Naptime review and these muffins look great!! !